For years it was blindly accepted that too much protein was bad for health and that only bodybuilders needed to worry about this part of the diet. For the fitness crowd, it's also been generally accepted that you need to crush a protein shake after every workout in order to avoid losing gains. Well folks, the research is out and let's discuss where things stand. Carbs: Sugar is still bad for you. Low-carb is all the rage and can be healthful, but genetics and lifestyle factors make this different for everyone. Fats: Increase your Omega-3 intake through oceanic food sources while decreasing your Omega-6 intake by limiting processed foods and vegetable oils. I'll elaborate more on these two macronutrients soon as well, so keep your eyes peeled on HuffPost Canada over the next few weeks! Protein is incredibly important. The human body is made of protein. Not just your muscles but your skin, hair, blood, bone and nearly every tissue of the body is composed of amino acids. 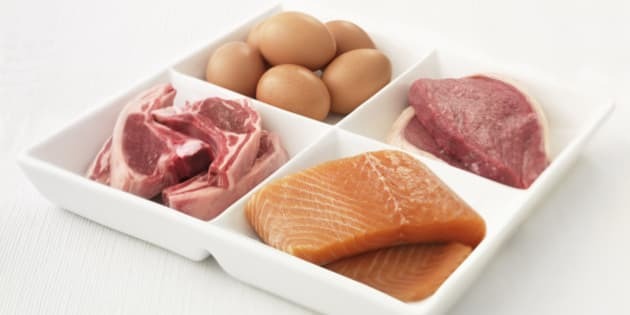 The amino acid pool of the human body is constantly being turned over (every second of the day) so dietary protein requirements never fluctuate: protein is always in need. Protein is required for optimal health and there's really no such thing as too much. Humans turnover between 300-400g of protein daily, so unless you're exceeding this amount you can be confident that your protein intake isn't harming your health (kidneys rejoice). Go the other direction however, and health can suffer. Eat too little protein and your body will have to work overtime cannibalizing existing tissues and creating protein from other valuable nutrients. Furthermore, you'll run the risk of failing to ingest enough essential amino acids- components of protein that the human body cannot synthesize and that we absolutely have to get in the diet. On the topic of supplementation, shakes are optional and there's little (if any) benefit to drinking a fast-acting shake right after a workout. Athletes and larger humans can still benefit from protein shakes (especially post-workout) but the benefit stems more from the overall amount of protein in the diet and less about the type of protein or precise timing. For optimal health and performance, every human should aim to consume between 0.7-1.0g of protein per pound of body weight. This total amount of protein is the #1 to consider when it comes to protein consumption. It's been well-demonstrated that going below this range will limit muscle and strength gains and can actually also stunt fat loss. In regards to workout nutrition, the timing of protein post-workout depends on when you last ate before your workout. The closer you ate to the beginning of your workout, the less urgent it is for you to take in nutrients post-workout. Make sure you eat protein at every meal. Fresh cuts of fish and meat are the most nutrient-dense options. One serving is roughly the size of your palm. Women should aim for 1-1.5 servings per meal and men 1.5-2 servings per meal. Make sure you consume somewhere near your body weight in protein daily (0.7-1.0g per pound of body weight). By aiming for the serving sizes above you can accomplish this goal. If you find it hard to meet daily protein recommendations through food alone, a protein supplement is an excellent alternative. If you have any questions about protein don't hesitate to post a comment! As mentioned, I'll be posting the latest info on fats and carbohydrates soon so stay tuned for that.